Solar power feed-in tariff (FiT) rates are usually fixed at a prescribed cents per kilowatt-hour (c/kWh) rate. There is, however, potential for solar system owners to get more value out of their solar energy by giving them access to the fluctuating wholesale electricity spot price of the National Electricity Market (NEM). Urth Energy is the first electricity retailer in Australia to offer solar customers direct access to NEM spot prices with its plan called Urth Trader. So, how does a spot market-based solar feed-in tariff work, and what are the benefits? A feed-in tariff is an arrangement through which your electricity retailer pays you a set amount for the solar energy that you send into the electricity grid. Until 2011, most states had government-mandated rates which were generally quite high – between 20-60c/kWh depending on the state, size of system, sign-up date and other factors. In recent years, however, solar feed-in rates have decreased substantially everywhere as state governments have closed incentive based plans to new applicants. These days, solar feed-in rates in most states are set on a voluntary basis by the electricity retailer. The going rate on offer by most companies is between 6-8c/kWh. At first glance this may sound like bad news, but the fact is that solar PV systems are more affordable than they’ve ever been, so a high feed-in rate isn’t necessary to make solar worthwhile. It does mean, however, that homes and businesses that go solar should try to use as much of their solar energy as possible to maximise savings. Every unit of solar energy consumed directly by the home is one less unit you need to purchase from the grid, where electricity generally costs between 20-30c/kWh. Solar feed-in credits have therefore come to be of secondary financial benefit to solar system owners, while solar ‘self-consumption’ is the primary goal. How does a spot market-based feed-in tariff work? The Australian Energy Market Operator (AEMO) is the body that oversees and manages transactions on the NEM. 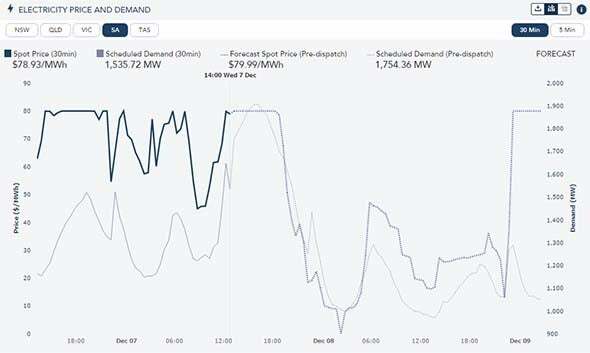 AEMO publishes current and forecasted spot prices and anticipated energy demand volumes that anyone can view here. They also send out alerts about when and where electricity demand is expected to be high, so that generators (and retailers) can make plans accordingly. Because they deal in huge volumes of energy, spot prices on the NEM are ordinarily described in dollar per megawatt-hour ($/MWh) terms, where a megawatt-hour is 1,000 kilowatt-hours. Ordinary energy consumers, however, would be more familiar with kWh figures, which appear on regular electricity bills for both energy usage and solar export numbers. What are the benefits of a spot market-based feed-in tariff? With a flat-rate feed-in tariff of 6-8c/kWh, there is virtually no incentive for a solar system owner to put their solar energy into the grid. With a variable rate, however, customers may choose to ‘selectively sell’ their solar energy to take advantage of high prices. This means that if the spot market price jumps to over $11/kWh for half an hour (which it did on 18 November 2016 in NSW), a solar home on a spot market-based FiT could receive over $30 for exporting 3kWh of solar to the grid. Urth Energy charges a 15% admin fee on all solar feed-in revenues. But the spot price doesn’t need to soar nearly that high for it to make sense to sell into the grid; even a spot price of 30-40c/kWh would be enough to warrant exporting solar energy. By endeavouring to export energy only when the spot price is above a certain threshold, a solar home has the potential to save significantly more on their energy bill than with an ordinary, fixed FiT. What tools are necessary to take advantage of a spot market-based FiT? Making the most of a spot market-based FiT like Urth Trader essentially entails turning off household devices to allow solar to ‘spill over’ into the grid when prices look like they’re going to be high. This can either be done manually or remotely (and possibly automatically) with an energy management system (EMS). A spot market-based feed-in tariff opens doors for battery storage system owners as well. With a battery storage system, a home may opt to not only send their solar energy into the grid when spot prices are high, but may also export their stored energy as well. Unlike a standard solar system (i.e. one without batteries), the volume and timing of the export of stored energy can happen independent of the weather – providing even more opportunity to make the most of the energy resources available with in the home. However, an energy management system or ‘smart’ battery manager may be required. Basic accumulation meter: This is the oldest and simplest type of electricity meter available, simply measuring the amount of energy entering or exiting a household, with no time stamp. Because there is no way to determine when the solar energy was exported in this scenario, Urth Energy averages the spot price for the billing period across all kWh of exported solar energy. Basic interval meter: This type of meter has a time element, meaning that it is possible to retrospectively ‘line up’ times of solar export with the spot price for each half hour trading interval. In this case, customers will be paid the appropriate spot market rate for each kWh of solar that they’ve exported over the billing period. 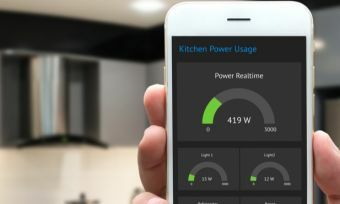 Smart meter: The functionalities of a smart meter depend on the manufacturer, but on a basic level they are all interval meters which are capable of tracking a customer’s electricity usage and export remotely, making billing easy for the retailer. More sophisticated smart meters can also make this data available to the solar system owner, delivering insights that help the customer reduce their electricity bills. A spot market-based feed-in tariff is best for customers who either an interval meter or a smart meter, so customers on a basic accumulation meter are encouraged to upgrade before moving on to a spot market-based FiT.